How in the world is it possible 66% of people in this survey believe stocks are either flat or down over the past ten years?!? Certainly, psychological scars from the financial crisis are part of the answer. After losing 55%, a number of investors simply took their ball and went home. They felt the market was rigged against them. Bankers were bailed out and they were left holding the bag. These investors likely checked out of the stock market and haven’t been paying attention to any gains since. However, I believe there is a larger and much more concerning reason people are unaware stocks have surged ahead: a lack of financial literacy. In a study conducted last year, the Program for International Student Assessment found that only 12% of 15-year olds scored at the highest level of financial literacy, and 22% scored below the baseline level of proficiency. If you don’t learn personal finance basics in school, it’s difficult to pick them up later in life which is why S&P Global found just 33% of adults show an understanding of basic financial concepts. I won’t fault anyone for not understanding “bitcoin”, but “index fund” and “asset allocation” are two terms every investor should know like the back of their hand. This shocked me almost as much as the survey in Barron’s. But, again, if you are not taught something or involved with it directly, it’s pretty tough to learn and get excited about. Add to this that many people, especially Millennials, are focused on the basics – paying bills, managing student loan debt, trying to figure out how to purchase a home – and you have the financial equivalent of “Maslow’s hierarchy”, where people are simply trying to take care of their most fundamental needs. Focusing on stocks and investing just isn’t a priority. In an ironic twist, while I believe a lack of financial literacy has contributed to investors missing out on generational returns they may never see again, I would also argue a lack of basic personal finance skills was a main culprit in causing the financial crisis to begin with. There were certainly many responsible parties to the financial meltdown, from unscrupulous mortgage lenders to overleveraged banks and rubber-stamping credit rating agencies. But the fact is people were buying houses they couldn’t afford with loans they didn’t understand and tapping equity in those houses to buy things they didn’t need (remember all those Hummers on the road in 2006-07?). The mindset was home prices could never go down and a house could serve as a piggybank. On top of that, while things were good, people weren’t saving enough money. As the recession took hold, people lost jobs, and there was no rainy-day fund to fall back on. There was no home equity to tap because homes were upside-down relative to mortgage balances. Mix in overly aggressive investment portfolios – people not investing in a prudent, diversified manner – and you had a recipe for disaster. To me, this was a culmination of a lack of personal financial education in our schools over a prolonged period of time. Think back to the courses you took growing up. Art, chemistry, auto shop, biology, music, etc. Unless you operate in a profession relying on these as a foundation, when was the last time you actually used anything learned from these subjects? I would go so far as to include algebra, geometry, and calculus here as well. However, basic personal finance skills? Do you have a mortgage, car loan, credit cards, and/or student loan debt? Do you have income and need to budget the money you spend daily? What about saving for retirement and putting together an investment portfolio? Money issues are the leading cause or a meaningful factor in each of the above. A survey conducted by the American Psychological Association found 72% of Americans reported feeling stressed about money at least some of the time during the past month. 22% said they experienced extreme stress about money during the past month. In March, Northwestern Mutual released the results of their 2018 Planning & Progress Study which found 44% of Americans view money as the dominant source of stress, more than personal relationships (25%) and work (18%). 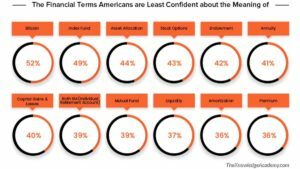 In addition, 28% said financial anxiety makes them feel depressed at least monthly, with 17% suffering depression as often as weekly, daily, or even hourly. There’s a saying that money can’t buy happiness. However, I have an uncle who always rebutted that with, “People who say money can’t buy happiness either have too much or not enough”. He’s right, which is why the Northwestern Mutual study also found that 87% of Americans agree nothing makes them happier or more confident than feeling like their finances are in order. I think the underlying problem is very simple – we have an enormous financial literacy issue in our country. If a lack of personal finance skills can contribute to a financial crisis and cause investors to miss out on generational returns, it’s a problem. A problem we need to fix now.